Boerboom Park is a gathering place for people of all ages. The City of Osseo is planning an expansion to Boerboom Veterans Memorial Park. The expanded park will more than double in size to cover an entire city block. Currently, the City Council is seeking feedback on how the new space can best serve the community. The summer Music and Movies in the Park event series is an Osseo tradition. This year’s schedule of events was recently approved, and it features seven concerts, five movies, and two educational presentations. Please join the fun on Tuesday evenings in June, July, and August for these all-ages community presentations. Do you love Osseo? Do you love movies? Do you love watching movies outdoors in Osseo? If you answered “yes” to any of these questions, please consider volunteering to be part of the 2017 Movies in the Park event series in downtown Osseo, Minnesota. You can help provide entertainment to the Osseo community! 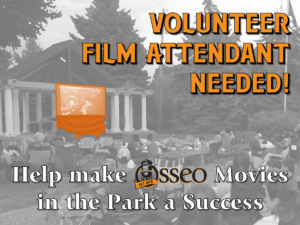 The Osseo Parks & Recreation Committee is seeking Volunteer Film Attendants for the summer 2017 Movies in the Park series. Volunteers are needed on select Tuesday evenings to set up and take down equipment, and to monitor movie screenings. All training and equipment will be provided. Total time commitment is between 2.5 and 5 hours each evening, depending on film length and other scheduled programs. Must be able to bend, lift, and carry equipment. Basic familiarity with electronics will be helpful. 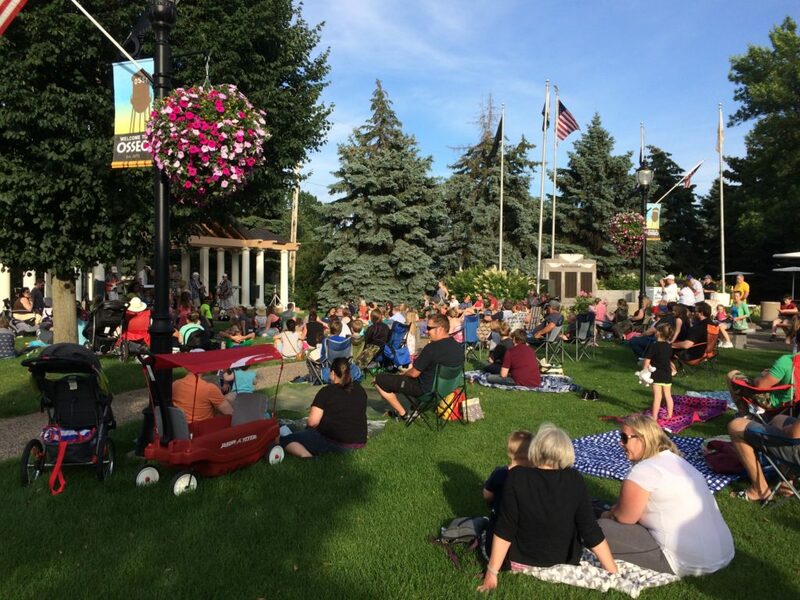 Music and Movies in the Park events are supported by individuals, businesses, and service organizations who donate their time and funds to provide these free events to our community. The City is also looking for volunteer drivers with a valid driver’s license who are willing to sign up for day shifts, be available once or twice a week or a few times a month, from May 1st through September 28th. 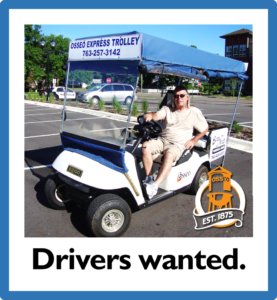 During their shift, drivers will take appointments by the Trolley phone and drive Osseo residents on a golf cart within Osseo city limits. Please contact Osseo City Hall at cityhall@osseo.mn.us or call 763-425-2624 with questions or to volunteer. After several months of hard work, the 2017 Sidewalk Replacement project is now complete. The project began last October when property owners received a Notice of Public Nuisance relating to Sidewalk Repairs required on your property. At that time, the City proposed to cover half of the cost of sidewalk repairs for property owners participating in a coordinated City project. The cost share was funded with an allocation of federal Community Development Block Grant (CDBG) funds, administered by Hennepin County. This spring property owners received a second notice when the City received bids and awarded a contract for the sidewalk repair project. Work on this project has now been completed. Overall costs for the project were much lower than expected. Due to lower costs, the City has been able to fund the entire project with CDBG funds and an additional contribution from the State of Minnesota’s Small Cities Assistance Program. Under these special circumstances, there will be no property owner contribution required for the 2017 Sidewalk Repairs. In other words, property owners pay nothing for the 2017 Sidewalk Replacement Project. We thank you for your patience during this project, and hope that everyone in the community will be able to enjoy the new sidewalks. As cooler weather approaches, we would also like to remind residential sidewalk owners of their responsibility to promptly remove snow from their public walkway. All snow must be removed within 24 hours. Those elderly residents unable to arrange for their own snow removal may contact the Household & Outside Maintenance for Elderly (HOME) Program of Senior Community Services. For more information contact 952-746-4046 or visit www.seniorcommunity.org. 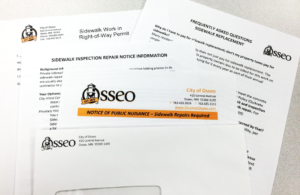 Sidewalk repair letters were hand-delivered by City Staff this morning. If you weren’t at home when the letters were delivered, please check around your front door to see if a letter was left for you. 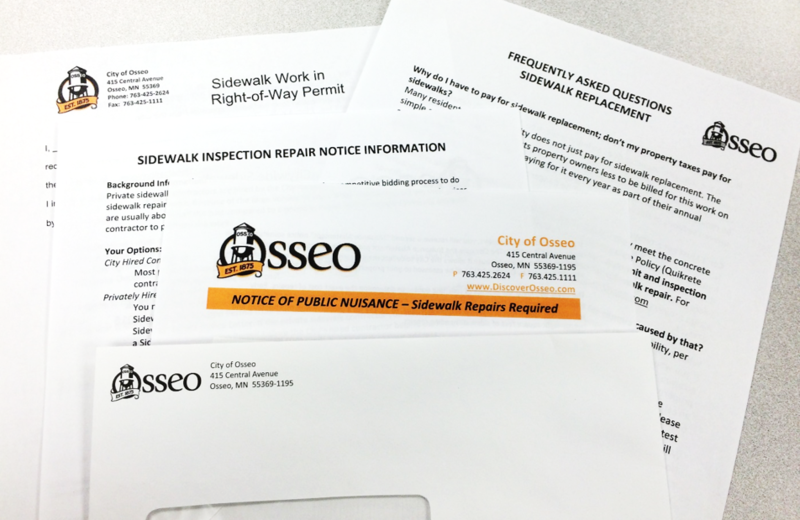 Safety for our residents and visitors is essential to the City of Osseo. Our small, historic community should be a place that is safe and accessible for everyone. This is an important goal, and everyone must work together to help our city be the best it can be.